July 10, 2017. 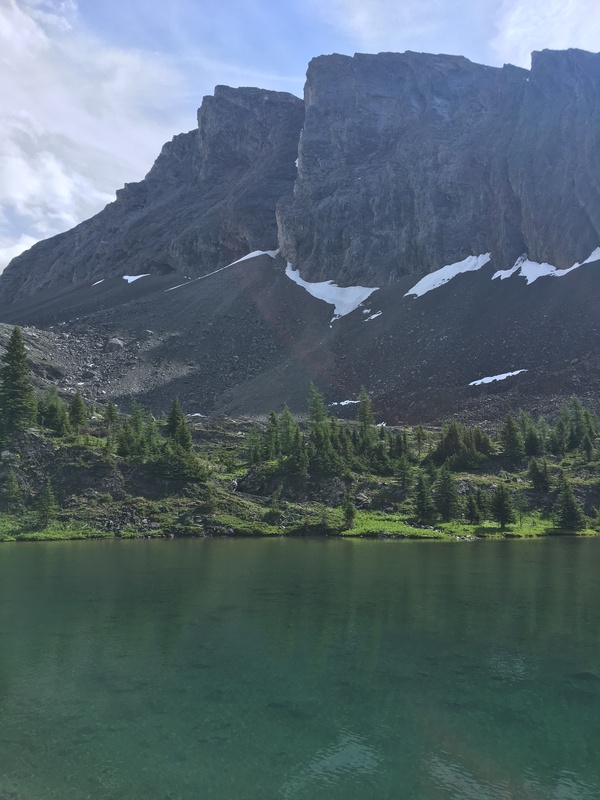 A solo hike to high mountain lakes in Kananaskis country. My wife, who is both intelligent and stunningly beautiful, told me that I could leave the family behind today and hike on my own. 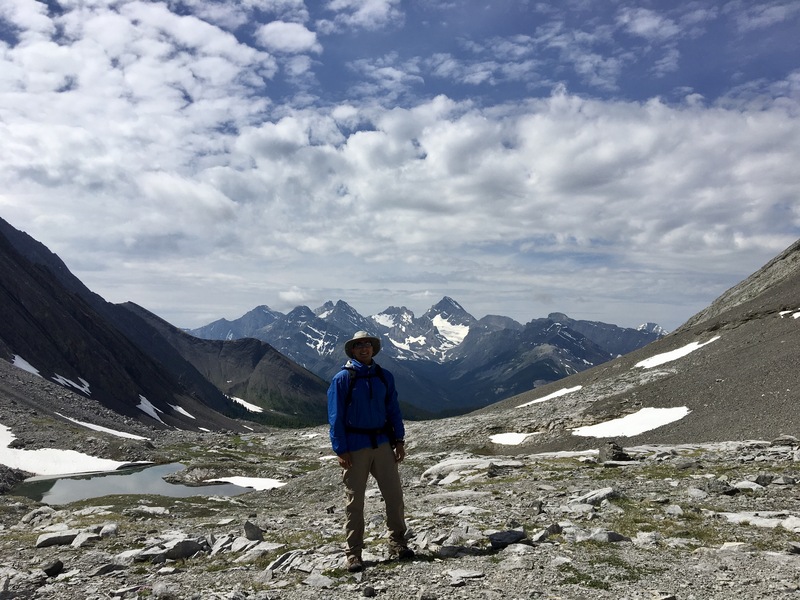 This was a departure from our original plan for the 3 days we’d have in Kananaskis, which was to do a hike with the kids every morning. However, yesterday’s events took some of the wind out of the sails of the kids, and a day of swimming and snacking seemed to be what was best for them. When the wife suggested I set off on my own, I didn’t argue and started poring over my guidebooks and maps. My original plan had been to climb Mount Allan. 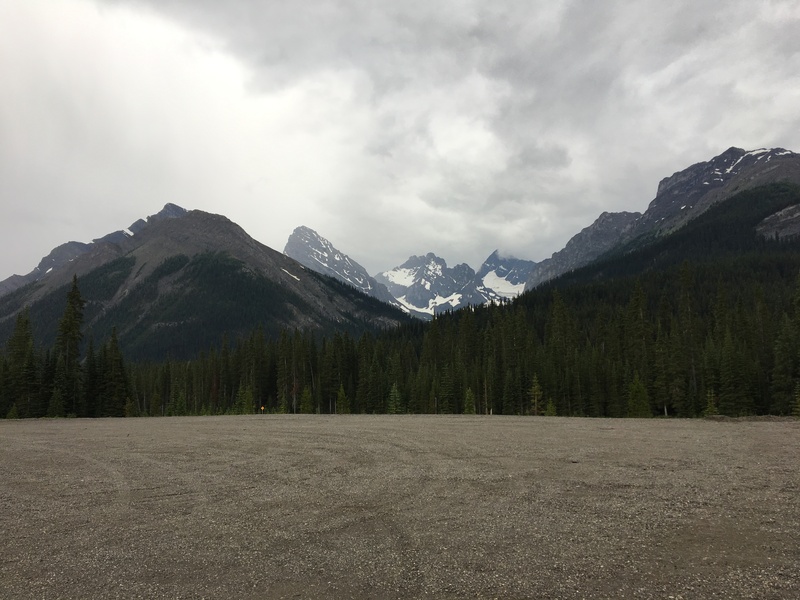 This is the mountain where the Nakiska ski area is located. It’s steep and takes a relatively long time to finish, but the payoff is reported to be worth it with amazing views and cool rock formations to see. As a bonus, the trail begins very near our hotel. I had to change plans this morning, though, when I woke to thunder and lightning. The rain passed, but the forecast called for more rain through the day, and a “chance” of thunderstorms all day. Not wanting to be that guy that’s caught out on a high mountain ridge when the lightning strikes, I modified my plan and set out for Chester Lake and Three Lakes Valley. 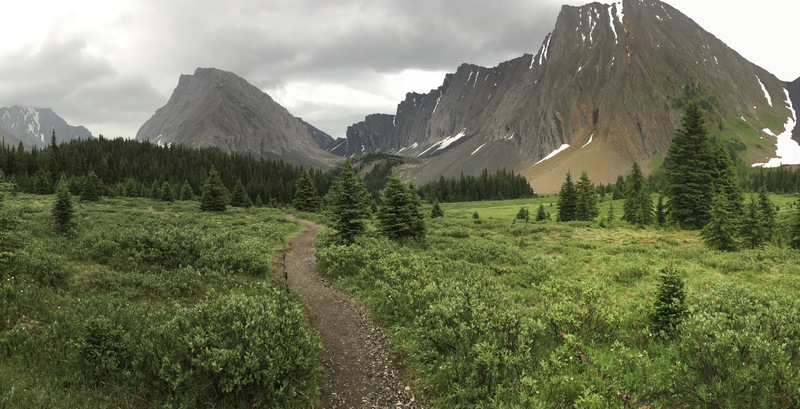 The Copelands (of Don’t Waste Your Time in the Canadian Rockies fame) describe this hike in their Where the Locals Hike guidebook. 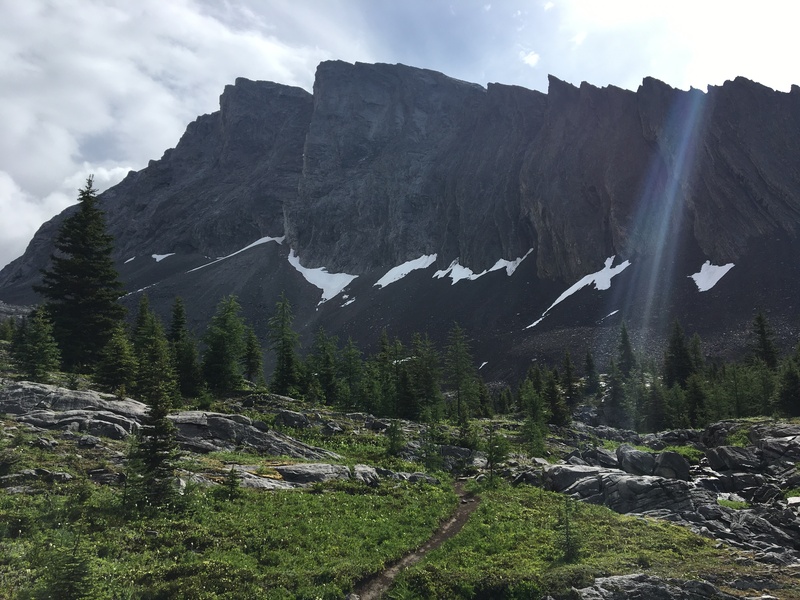 They describe it as a “premiere” destination and say that it’s the most popular hike in K-country. When I saw the size of the parking lot at the trailhead, I had no choice but to believe them. They also name it as one of their recommended rainy day hikes. I gotta say: they’re right, this is a premier hike, and a great choice for a rainy day. 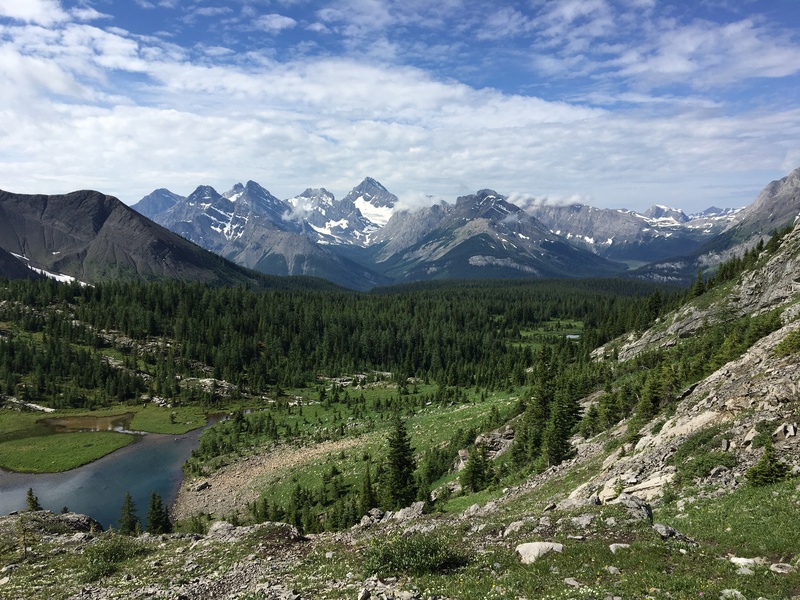 Access is easy via Highway 742 (aka Smith-Dorien/Spray Trail), which you can get onto from the north (via Canmore) or south (via Highway 40, to Kananaskis Lakes Trail, to the Highway 742 turn-off). Highway 742 is gravel, but very well maintained – it’s wide and reasonably smooth. The turn-off to the trailhead is very clearly signed. There are pit toilets at the parking lot, as well as aother toilet up at Chester Lake. Off the start, you head up an old logging road, with a pretty steady altitude gain. You’re in amongst the trees here, and today the mosquitoes were out in force. There was a drizzle of rain as I set out, so I was covered by my rain jacket. Between the jacket and a bit of Deep Woods on my exposed skin, I ended up with zero bites. On my way down I encountered some folks in T-shirts and shorts. They inquired about the trail and I mentioned the dense mosquitoes. They didn’t have any bug spray, so I offered mine. They declined, saying that they were “used to” mosquitoes. I can only assume they were from Manitoba. 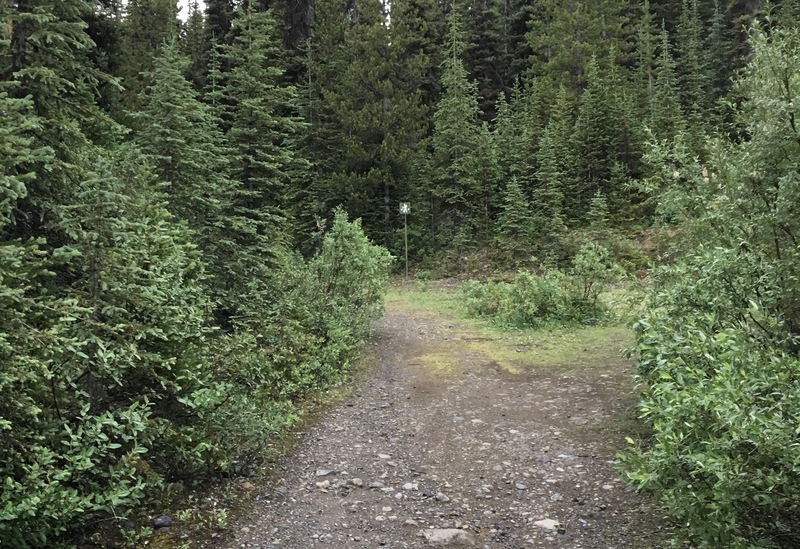 The trails heading up to the lake are used by hikers, as well as cross-country skiers and snowshoers in the winter. The hiking trail follows the ski trail. A short way up, the trail splits in two. You can go either way – both trails join one another again a short distance below the lake. I went left and came back down via the right trail, making a small loop on this section of the track. After the trails join together again, at about 2.2 km from the trailhead, you are about 700m from the first clearing and your first views of Mount Chester and the nearby peaks. Press onwards to another clearing at 3.9 km. Here, you’ll encounter several branches of a meandering stream and get clear views of Mount Chester. Not long after, you’ll pass an elevated pit toilet on your left and arrive on the shores of Chester Lake. Moving at a steady clip, I reached the lake in 1h 5m. The lake itself is a pleasant, crystal-clear mountain lake. Opposite the trail when you arrive is Mount Chester with a talus slope spilling into the water. When I got there the rain started to fall a little harder, so I hid out under a tree to snack on a sandwich and check my map. When the rain eased up, I decided it was worth continuing up to Three Lakes Valley. 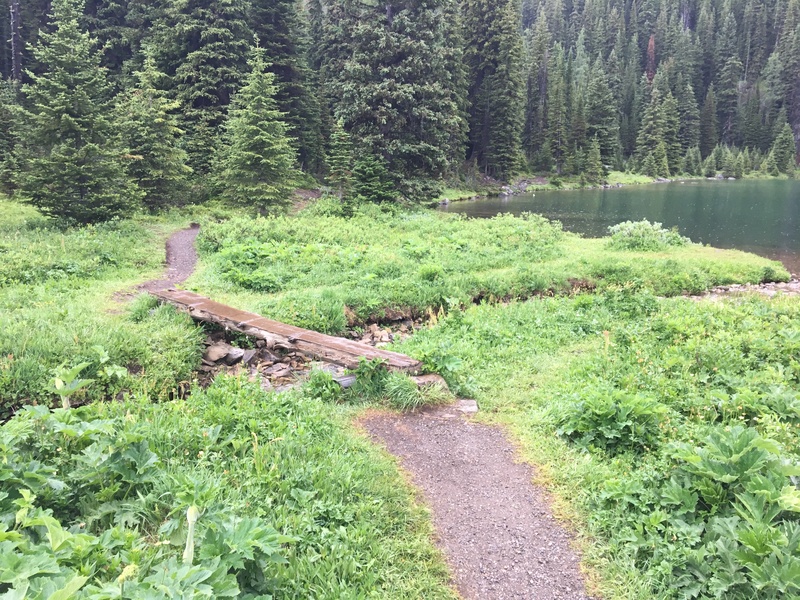 Soon after the main trail arrives at Chester Lake, proceeding clockwise, you’ll encounter a log bridge over a small stream. 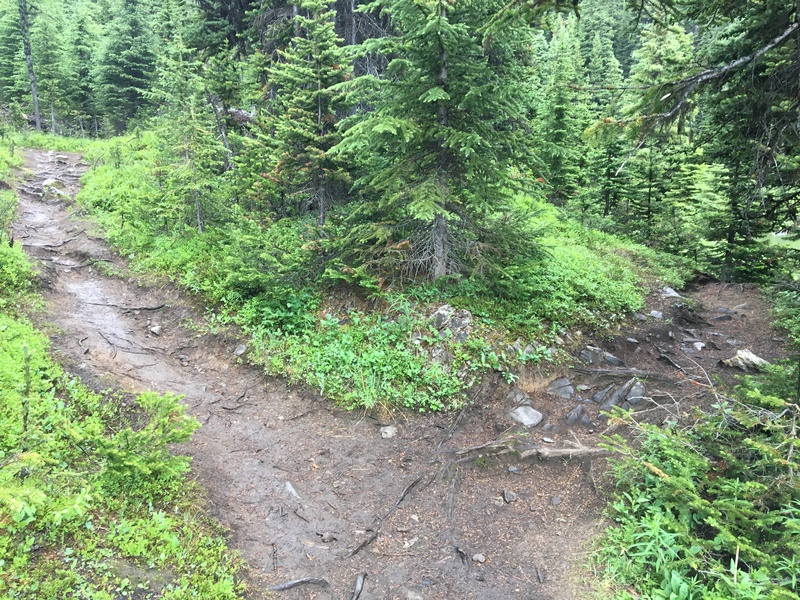 About 60m beyond, there’s an obvious fork, with the left trail heading away from the lake, and the right fork continuing along the lake shore. Take the left fork and begin ascending north-east, up and away from Chester Lake. 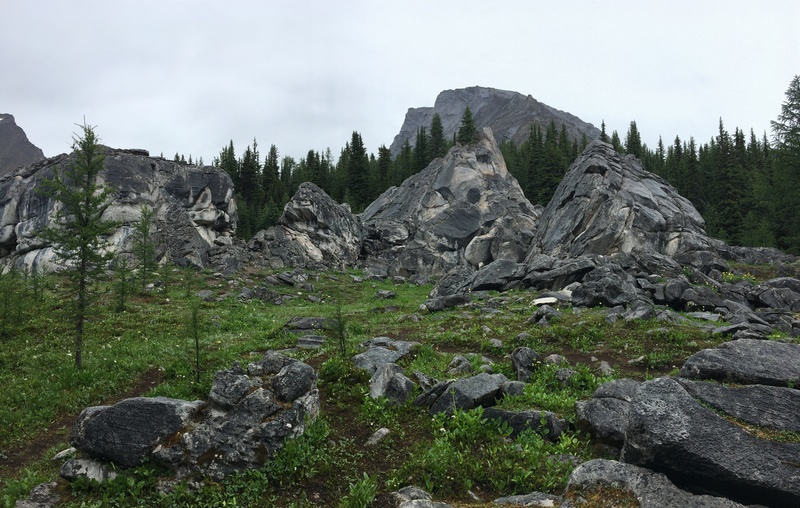 In a little less than 300m, you’ll encounter some interesting boulders, which Daffern calls the “Elephant Rocks” in Kananaskis Country Trail Guide Vol 1. These are interesting boulders that look a little bit out of place. The effect is sort of ethereal, and on the way back down the trail (when the rain had moved off) I encountered a group of yoga enthusiasts unrolling their mats on the grassy clearing next to these rocks. The trail veers left of the boulders and continues climbing. At around this point in my trip, the clouds parted and the sun came out. The sunshine highlighted the vibrant green vegetation and the white of the rushing stream nearby the trail. Soon after the Elephant Rocks, a rocky shelf comes into view up ahead, with the big peak of Mount Galatea peeking over. A short climb later, you arrive at the first of the 3 lakes. I was about 1h 50m into the hike at this point. The first lake is a pleasant, transparent blue-green tarn, sitting under the ridge of Gusty Peak. The trail continues around the left of the water and begins to climb. When you gain the rocky lookout above the first lake, the views back down the valley become awe-inspiring. You can see down onto the first lake, and beyond are the big peaks of the Continental Divide, with Mount Sir Douglas and the Robertson Glacier dominating the view. The trail continues into a rocky moon-scape, leaving most of the greenery behind. 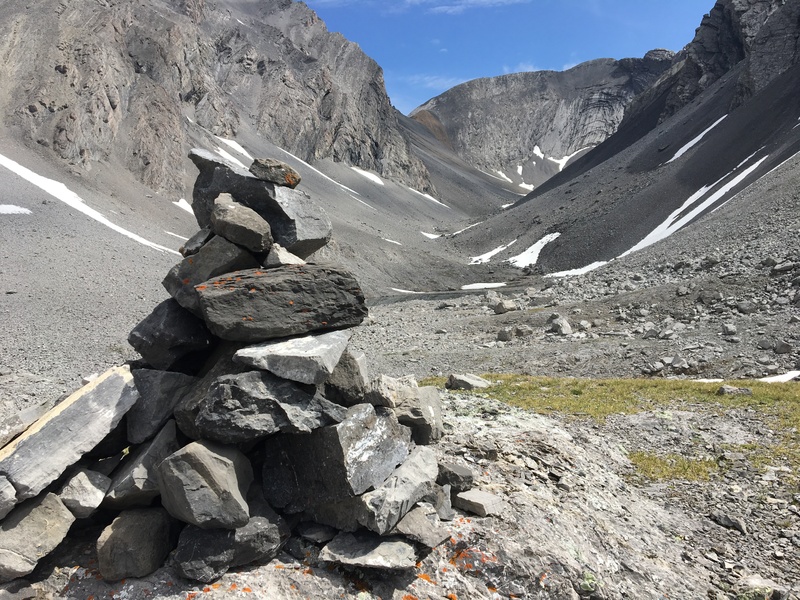 Eventually the trail vanishes and cairns appear, guiding you to the second and third lakes. The second lake and its environs are the best part of the hike. 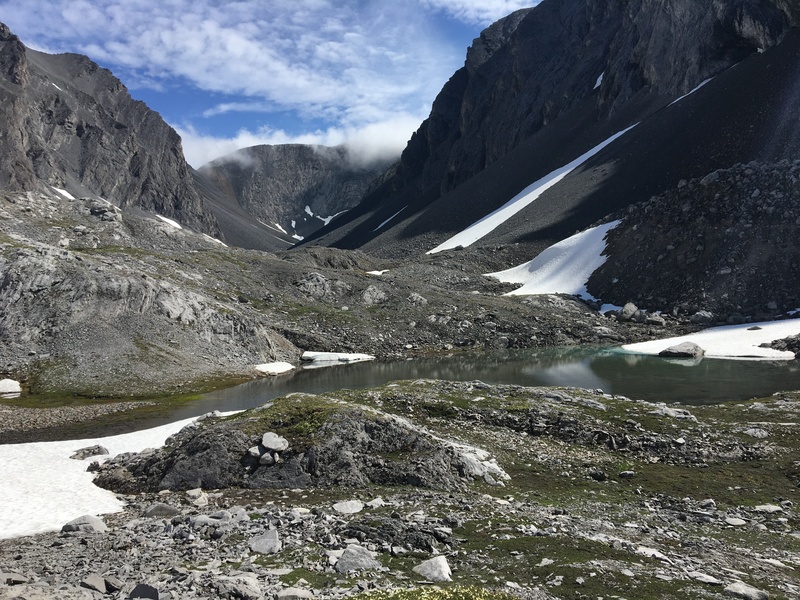 The third lake is small and not particularly impressive, but it is huddled in the austere, almost brutal beauty of the talus fields below Gusty Peak and Mount Galatea. There is one final large cairn that looks down on this third lake. This was an amazing hike. In part this was because of the views. In part it was because of the solitude. I did this one on my own and arrived at the trail well before anyone else. I think I had the valley to myself for a couple of hours at least. There’s a reasonable chance that, while I was on the shores of the 2nd lake, I was more physically isolated from all other people than I’d been in my life. I only encountered one other hiker when I was making my way back down from Three Lakes Valley. I met several more parties below Chester Lake. I have to say, though, that if your intent is just to go to Chester Lake and not continue beyond, then you may consider doing Elbow Lake instead. It’s further south down Highway 40. 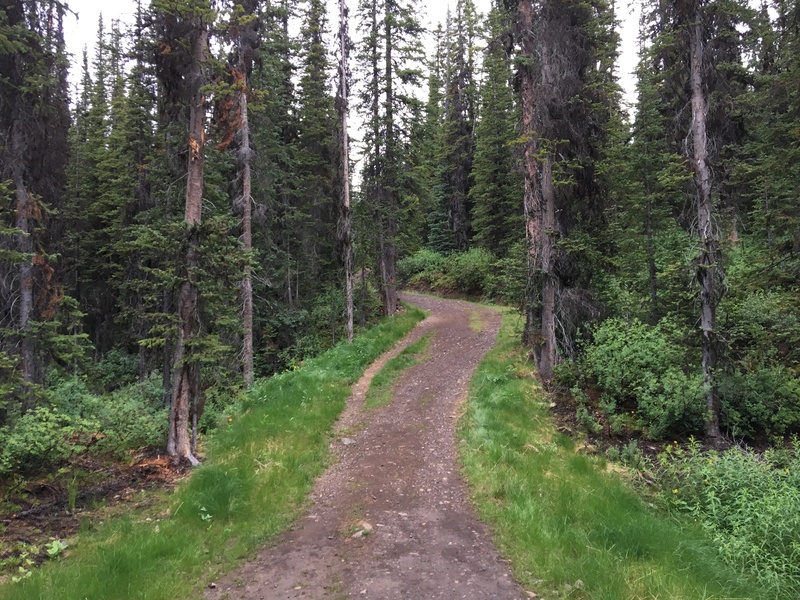 Like Chester Lake, the trail is an old logging road that proceeds at a steep pitch through the trees. But the uphill slog though trees is shorter on the Elbow Lake trail, and the lake is more impressive. 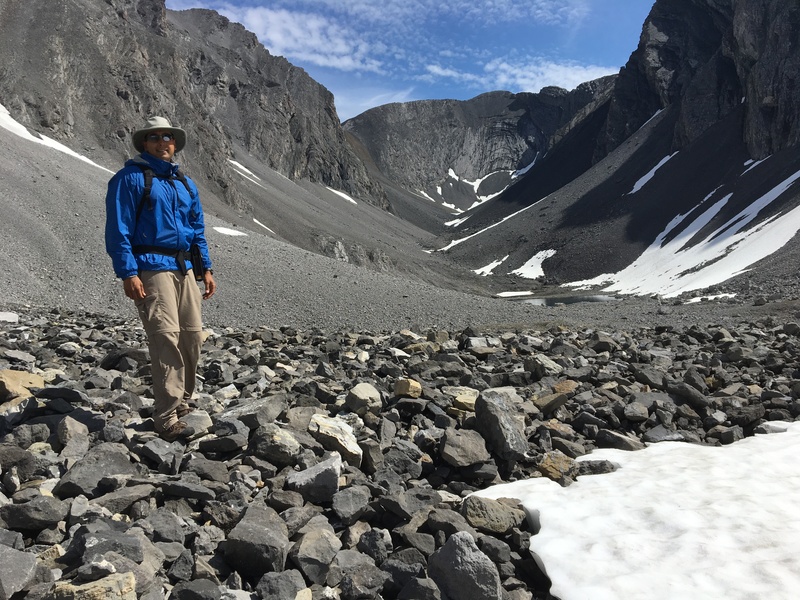 I have read about the options for venturing beyond Elbow Lake (Tombstone Lakes looks like a great trip) but I haven’t actually done any of them. My GPS apps tell me my route was 15.6km long, with 580m elevation gain. My total round-trip time was 4h 31m. Elevation data. I took a different route down than up, so it’s not perfectly symmetrical. I arrived to find this colossal, empty parking lot. Clearly this is a popular place. 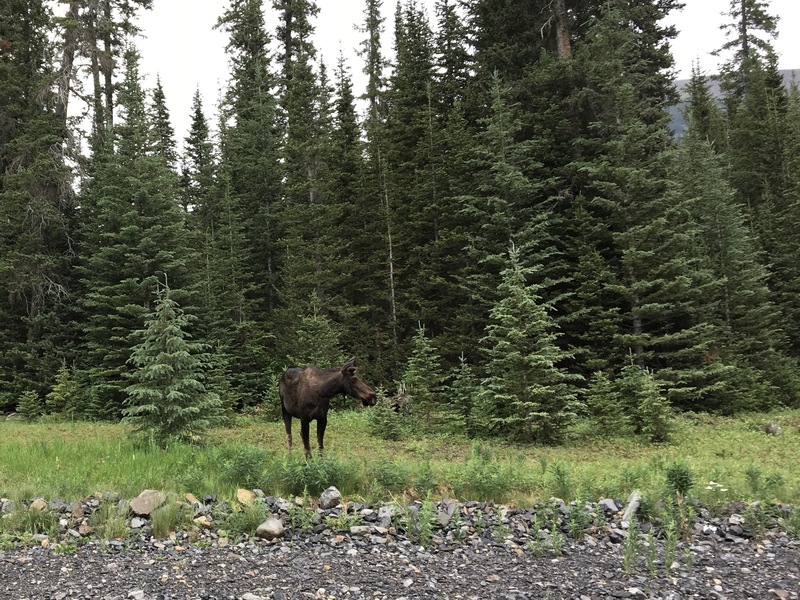 I was on the lookout for bears, but the only big animal I saw was this moose shortly before reaching the trailhead. The trail below Chester Lake is an old road. It’s wide, clear and fairly steep. Here’s the sign where the trail forks. I went left and came back down via the right. This is where the trail re-joins. Shortly after, it becomes less of a road and narrows down somewhat. Before reaching Chester Lake, you’ll pass through a couple of clearings, where the views finally open up a bit. Mount Chester is on the right. 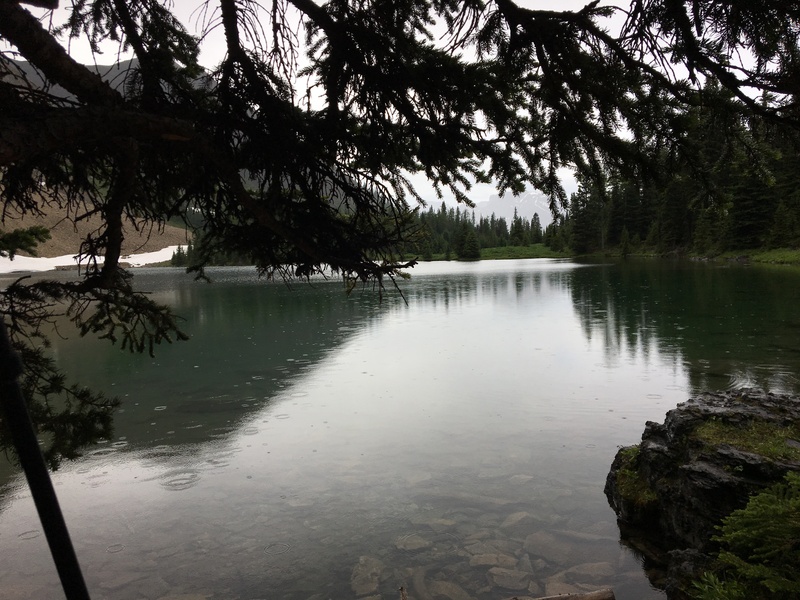 Chester Lake in the rain. I hid out under a tree. There was rain, but no thunder and lighting. Things eventually eased off again and I decided to head up the valley. Soon after arriving at the lake, you’ll encounter this bridge as you proceed clockwise. About 60 meters beyond is the fork in the trail that marks the start of the climb to Three Lakes Valley. Here’s the fork in the trail. Heading to the left, the trail begins to climb steeply and heads towards the “Elephant Rocks”. There were a few other side-paths arising from the main trail, but none as prominent as this one. The “Elephant Rocks”. This picture doesn’t really do justice to how strangely out-of-place they seem. 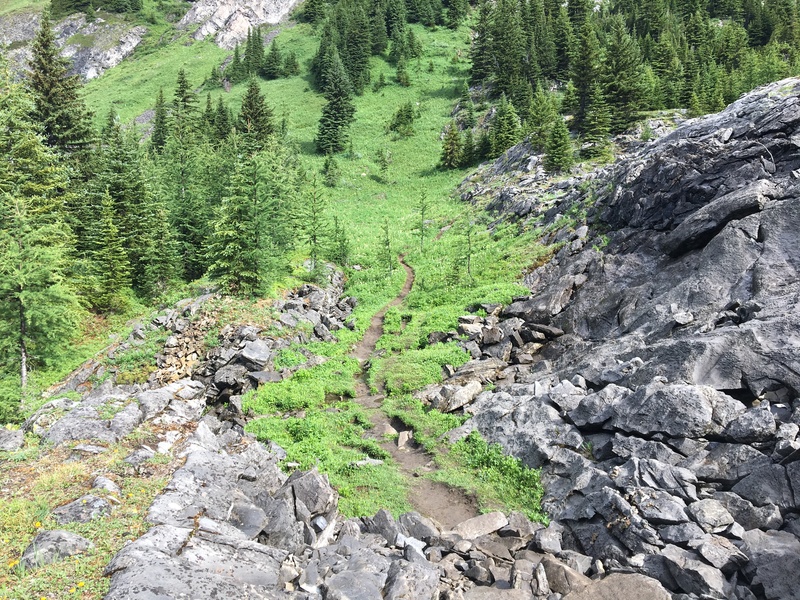 Up beyond the boulders, the trail continues through lovely green and grey terrain. The trail turns right up ahead and climbs towards the first tarn. The serrated ridge of Gusty Peak is in the background, looking like Godzilla’s spiny back. The sun was out by the time I reached the first of the 3 lakes. As the trail climbs above the first lake, looking back you see this. Here’s where things get gorgeous. That’s Mount Sir Douglas in the distance, cradling the Robertson Glacier. Beyond the first lake, the pleasant greenery ends, and you enter a vast talus field. The second lake. Navigation to here and beyond is aided by scattered carins, but they’re actually kind of hard to see. 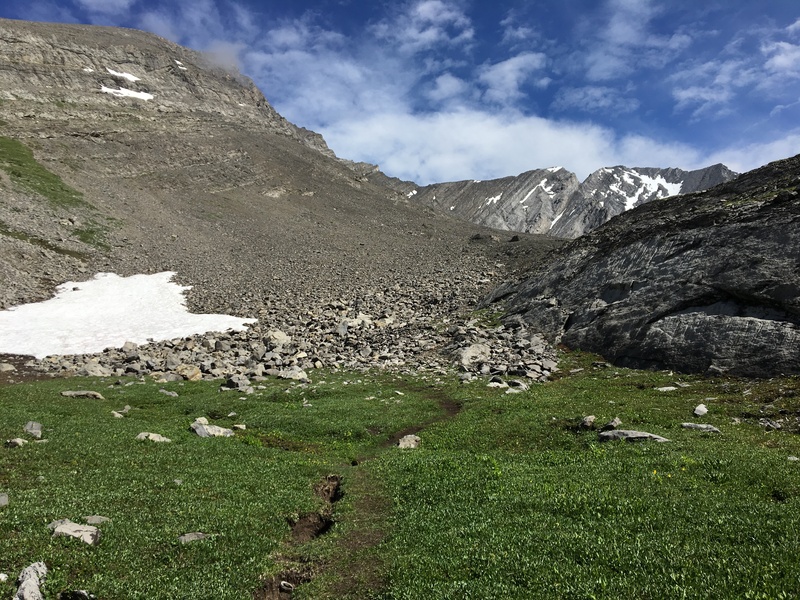 It’s not that you could get lost, but there are definitely better and worse ways to navigate the talus field. Here’s me, with the tiny 3rd lake in the background. The final cairn, overlooking the 3rd lake. 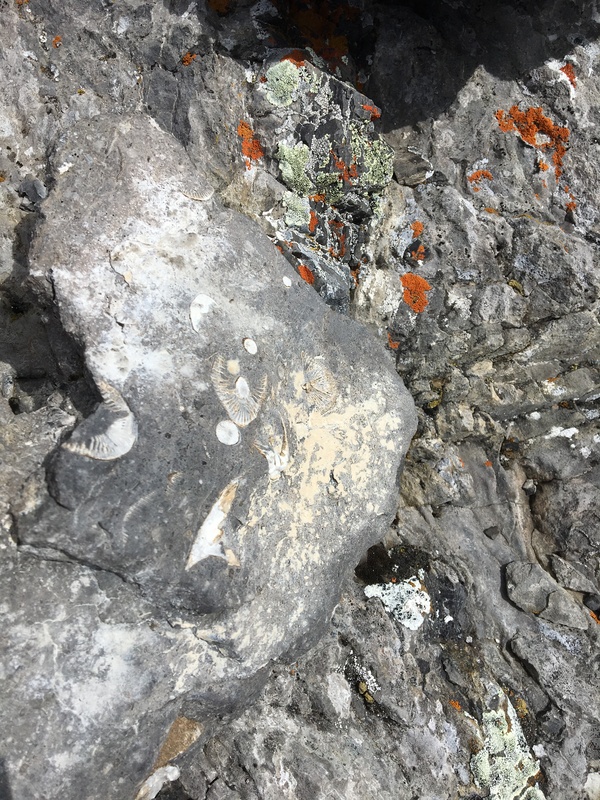 Some small fossils in one of the rocks making up the final cairn. Me, feeling pretty darn good about this hike.